Timothy was no John Wayne; Neither are you. Where is this “power, love and self-control” to come from. In John Wayne movies the hero is a rugged individual who needs no help really. If he has a side kick, John Wayne was always the senior partner. Timothy was apparently a more timid man – the opposite of John Wayne. Most of us are like Timothy, and probably none of us are like John Wayne, even John Wayne. In other words, we need support. 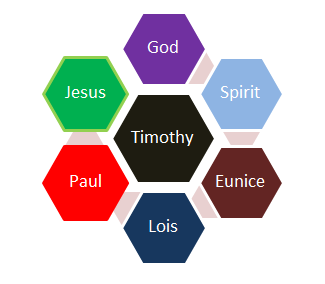 To illustrate I color coded all those who supported Timothy, to keep him from fear and to give him power. 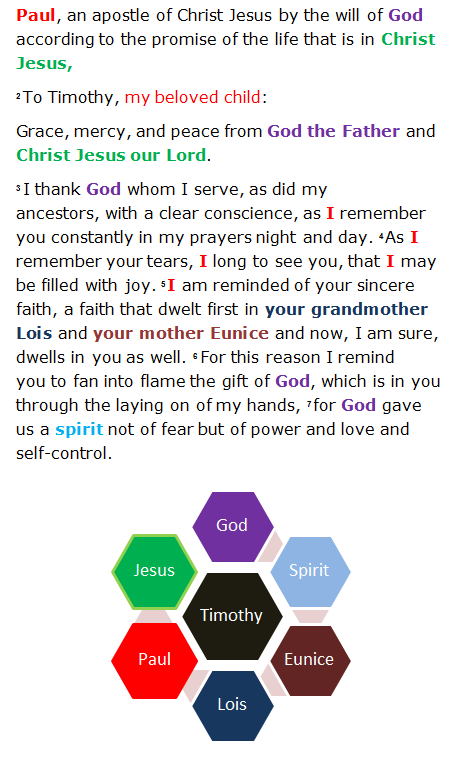 The strength comes first of all from God and Christ through the gift of the Spirit, and by Paul as his father and mentor and by his mother and grandmother. You see it is pretty crowded here. 8 But what does it say? “The word is near you, in your mouth and in your heart” (that is, the word of faith that we proclaim); 9 because, if you confess with your mouth that Jesus is Lord and believe in your heart that God raised him from the dead, you will be saved. 10 For with the heart one believes and is justified, and with the mouth one confesses and is saved. This is a Gospel verse. The word “Gospel” comes from old English and it means Good News. 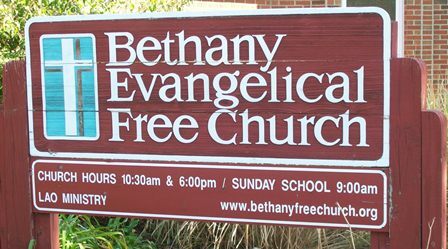 We are here at Bethany Evangelical Free Church. The word Evangelical – do you know what it means? Some people think it means a group of people who vote a certain way. A pastor friend of mine says that they get this call from time to time: “You are an Evangelical Free church, does that mean you don’t have any Evangelicals there?” They think Evangelical Free is like Sugar Free. Gospel is English for this word Evangelical. “evangel” is a Greek word that means good news. This is important because the Christian message is not about how to be good. Lots of people think that the reason to be a Christian is to learn how to be good, how to be a good neighbor and how to earn a place in Heaven. We have the word Evangelical in our name. We have the word Gospel in our message to remind us that the Christian message is not what we do for ourselves. It is what God does for us. That is the Good News. It is not about being good or becoming good, it is about being welcomed by God as if we are good. Saving ourselves would be bad news – just ask all the people who know you if you are perfect. Only what is perfect is fit for God. So earning your way to God’s blessing is bad news, receiving God’s approval and blessing is the Good news. what I was thinking about during the mindfulness lecture. This can be a good exercise for a Christian as well. I remember when I was in college and I used to go and sit in the church sanctuary that was near campus. After a half hour of sitting and resting my mind and my ears, I was in a much calmer frame of mind. Sometimes I take a walk outside and enjoy the world that God has made. Meditation as described in scripture is something different. Rather than clearing the mind, it seeks to fill the mind. Rather than emptying the mind, it seeks to fill it with the scriptures. And rather than being a thing I do alone, it is something I do in fellowship with God. We do not meditate about God, we can meditate with God. We are out of shape. We are out of practice. Many of us do not know how to do biblical meditation. There was a study reported in the news. Three fourths of men and 1 third of women in the study could not even tolerate 15 minutes of silence without a book a radio or the internet. When given a chance to think about nothing or receive a small electrical shock, they chose to be shocked! We have so much outer life, that we neglect the inner life. I sometimes preach a sermon in the form of a congregational meditation. It takes this shape. Observe each word and phrase. Connect the verse to your world. Another part of the Favorite Verses series is Micah 6:8. What I am noticing is that the words are loaded with associative meaning in this verse. “mortal” is ‘adam“. Translated a man or here in the NIV, ‘mortal’. Remember this association when we get to walking humbly, and how the first couple (adam includes male and female – Genesis 5:1-2) walked with God in Eden until they upset justice by not keeping a command. “good” is how God described the created world in Genesis 1. The parts of creation were in place and working properly – except for “adam” being alone. “act” is a word in Hebrew that can mean simply to do in a general sense, but it is also used many time to “make” or “offer” a sacrifice. In the the previous verses the prophet gives voice to the question of the people: what offering should we bring? The answer seems to be to bring justice. I don’t think this is a denial of the role of sacrifice and worship, but that those actions were to encourage and accompany a life of just living. The following section lists some of the injustices of the people. The Prophets often say that worship does not compensate or cover up an unjust life (See Isaiah 1). Isn’t this an interesting comparison to Romans 12 – where the apostle says that our reasonable worship is to “offer” ourselves as living sacrifices and follows that with a chapter with many practical applications of the command to love God and love Others. 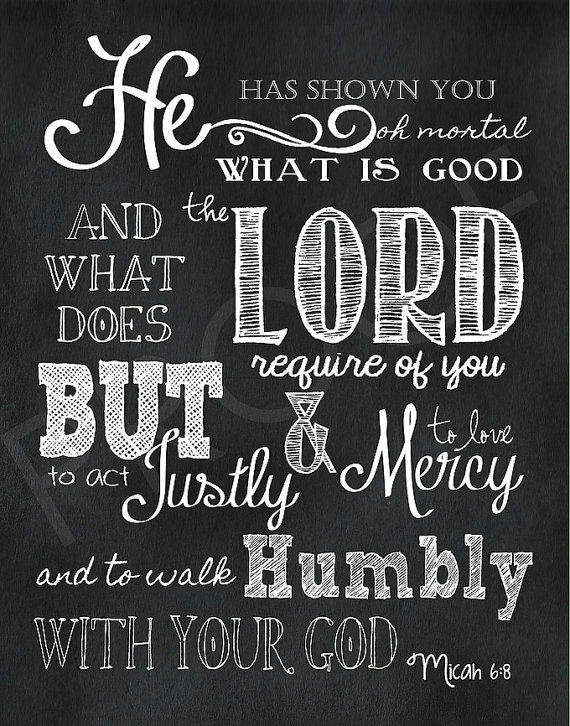 “mercy” is the Hebrew word “hesed” which can mean kindness, or mercy. It can also refer to a covenantal idea. God has committed himself to merciful faithfulness to his people. As a result he expects merciful faithfulness. Our faithfulness is to God and our mercy is for others. “love” is the same verb as the great commandment, to love the Lord your God. There is no separation between loving God and loving mercy. “He who oppresses the poor shows contempt for his maker.” Pv 14:21. “walk” is a widely used metaphor for our course in life. (e. g. Psalm 1 ) The original couple walked with God in Eden, until they with a profound lack of humility attempted to “become like God” by breaking the solitary prohibition that they had been given.